Olivetti PR2Plus Multi document Passbook Printer: This PR2Plus printer is a high speed dot Matrix printer with 2 serial, Parallel and USB interface. This printer can also read MICR (magnetic ink) on checks. 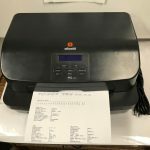 All printers are refurbished and come with a 90 day warranty. For more information on service, repair and parts please call Hardtec (408)846-2708 or toll free at 1-855-HARDTEC We stand behind all our products 100% Guaranteed. About us: Hardtec is a leading provider in sales and service of many financial printers, encoders and scanners.